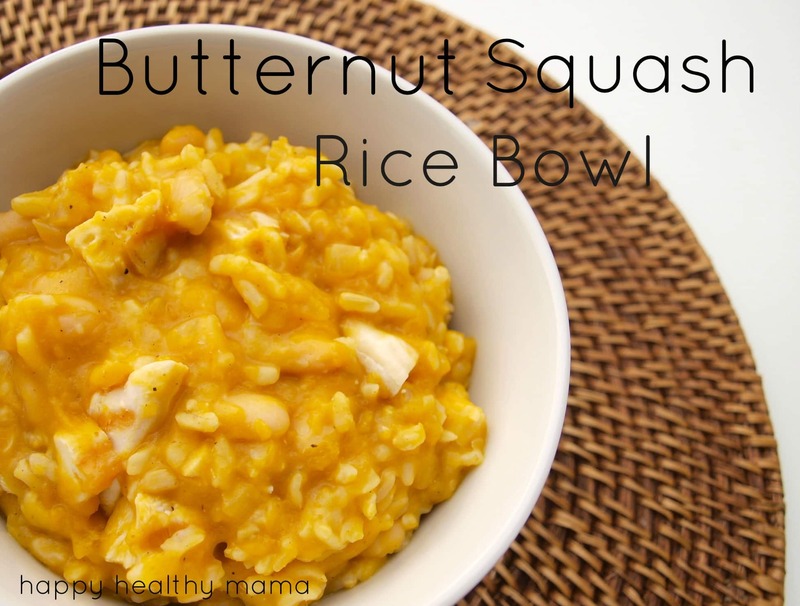 This butternut squash rice bowl is so creamy, so decadent, you will never believe that it’s dairy-free. This is one of the most sinful-tasting healthy dinners I’ve ever had. Not only does this dinner taste fantastic, but it can also be quick and easy, ready in 20 minutes. I say “can be” because if you have cooked rice and butternut squash ready, it comes together quickly and you can have a healthy dinner, super fast. Even if you don’t have cooked rice and butternut squash, while it takes a little longer, that part is totally hands-off preparation and it’s still an easy dinner. I’ve made this both with and without chicken, and it’s great both ways. I’m including the chicken version in the recipe because that’s what Tim prefers (typical husband, right? ), but it’s easily made vegan by leaving it out and using vegetable broth instead of chicken broth. This recipe was inspired by my vegan butternut squash enchiladas, which I can’t have while I’m not eating gluten. I love that recipe, it’s easily one of my favorites, but I might like this one even better. If you already have your butternut squash, rice, and chicken cooked, skip this paragraph. If not, read on. To cook your squash, cut it in half and scoop out the seeds. Place it face down on a baking sheet and roast at 400 degrees until it is fork tender, 30-45 minutes depending on the size of the squash. Once the squash is cooked you should be able to scoop the flesh out into a measuring cup. (Leftover cooked squash is great for butternut squash smoothies!) Cook 1 cup of dry rice according to the package directions. Cook the chicken until it the internal temperature is 165 degrees (bake it, grill it, whatever you like). Heat your oil in a large saute pan over medium heat. Add the diced onion and cook until it is slightly browned, about 5-8 minutes. Stir in the coconut milk, broth, ginger, coriander, cumin, salt, and pepper. Allow to simmer for a few minutes. Stir in the cooked squash. If needed, use the back of your spoon to break up some of the squash pieces until it is well-incorporated. Taste it, and if you prefer add more salt and pepper. Stir in the rice, chicken, and white beans and allow to cook a few minutes to heat thoroughly (unless you just cooked them and they are already hot). Finish with the lime juice, if you are using it. Enjoy! GASP! This is looks *seriously* fantastic. I will definitely be making this! I just made gluten-free Pumpkin & Black Bean enchiladas similar to yours. I subbed out the flour tortillas for white corn. Sure they’re not quite as good as using flour tortillas, but Trader Joe’s has a white corn version that are super cheap (.99 for 12) and don’t taste very corn-y. *edit* the corn tortillas break a little easier, so I suggest making enchilada stacks instead of rolled enchiladas. Thanks for this great recipe – all safe ingredients for my son so I’ll have to try it. This looks like the most delicious risotto…love this idea! I never know what to do with butternut squash so thank you for the fantastic idea. Looks great– I just made a butternut squash mac and cheese! awesome. egg-free too. This is the exact recipe I needed to see after discovering new food allergies today! Thank you! Mmmm…. We all loved it! Thank you for the perfect busy Monday night homemade meal! I was so glad when I read this and had all all the ingredients on-hand. I must confess I had a can of organic butternut squash. And I love making brown rice in my pressure cooker- 40 min rice made perfectly in 15! It was perfect and delicious and we all had 2 bowls. Well, not the 3.5 yr old, but the 14 month old did. I love your recipes because they are always good and my kind of cooking and health. Thanks! I’m glad you liked it! I’ve been getting butternut squash in my CSA box, but I’ll have to keep the canned idea in mind for winter time. That will definitely make this recipe even easier! This looks so delicious! I have been vegetarian for 18 years and this year I cooked my first butternut squash! I made the mistake of peeling and chopping it; it took forever! I’ll be baking halves from now on. I just made this for lunch with a few modifications based on what I had on hand. Delicious! Thanks for a great recipe !! Thanks for coming back and letting me know you tried it, Michelle. 🙂 Glad you enjoyed this. I made this over the weekend and LOVED it! I made it with chicken, and I am a fan of chicken generally, but I think I would prefer it without. I subbed in a little ground ginger as I was too lazy to grate the real stuff. Thank you for the great recipe! You’re welcome. I’m with you on the chicken, but my husband much prefers it with so I tend to make it with more often than not. Made this the other night and it was great!! I was a little bit nervous because I was doubling it and we were having company over! Sometimes not the best way to try out a new dish. We ALL loved it though, kids and adults. Thanks so much for another great recipe! This was awesome! Used two cans of beans (canellini, not sure if those are white kidney beans lol) because I was too lazy to cook chicken. Realized my jar of coriander doesn’t come out of hiding nearly enough. Love that the rice and squash can be prepped earlier to make for a pretty quick dinner. Can’t wait for lunch leftovers. Thanks! I just made this and loved it. I didn’t have beans so I used frozen green peas and it worked really well. I also added the tiniest pinch of cayenne (maybe 1/16 tsp?). I recently went dairy free because it gives my little baby reflux, and I love the yummy non dairy recipes you have on your blog! I’m glad you liked this! I think my family would like it with the green peas, too. Good idea. 🙂 I started making a lot of my recipes dairy-free when I discovered my son Luke was milk and soy protein intolerant. He’s 21 months now and still can’t have dairy so we try to keep it out of the rest of our diets as much as we can, too. Made this for the second time and love it so much. This time around I subbed in canned butternut squash and added lime juice and a little curry powder at the end. Definitely not as wonderful with the canned squash but totally works in a pinch. The curry was a nice touch!